System Preservation Guide Wins Award! 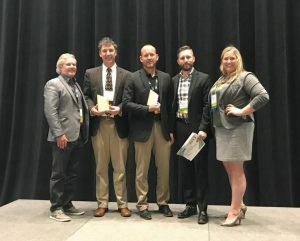 The LRRB sponsored project System Preservation Guide – A Planning Process for Local Government Management of Transportation Networks has won a prestigious award called the Around the Bend: Response to Change. It was given out at the Minnesota Chapter of the American Planning Association (APA MN) 2017 Minnesota Planners Conference in Mankato, MN on September 27. The conference theme was Around the Bend: What’s Next for Planning. During this project, researchers provided consulting services to five pilot counties to guide them through a process to define and communicate their system preservation needs and gaps in funding, evaluate and select strategies to address these needs, and implement those strategies. Participating counties were Anoka, Dakota, Freeborn, Otter Tail and Stearns counties. While each county chose strategies specific to their own needs, all five successfully built consensus among their elected officials and the public to pass either a sales tax or village tax to increase maintenance funding. Based on the pilot counties’ experiences, researchers developed an interactive tool to help other local agencies in Minnesota follow a similar process. Visit the LRRB website to view this project page with more information. Read feature article on this project in the Summer 2017 issue of Pavement Preservation Journal. Accepting the award (from left to right) are: Michael Marti, SRF Consulting; Dan Sullivan, MnDOT Research Services, Andrew Witter, Anoka County, Lance Bernard and Stephanie Flalkers, SRF. Absent is project Technical Liaison Sue Miller and LRRB Chair Lyndon Robjent.